Helping couples who can’t get pregnant on their own is, as it turns out, not so different from the science taught in reproductive physiology courses that Kristin Sieren-Behmyer took in the Animal Science Department at Iowa State. You collect some eggs. Collect some sperm. Put them together in the laboratory. And transfer the resulting embryos into the uterus. In cows, this is a fairly straightforward process. But with humans, there’s the, well, human side. 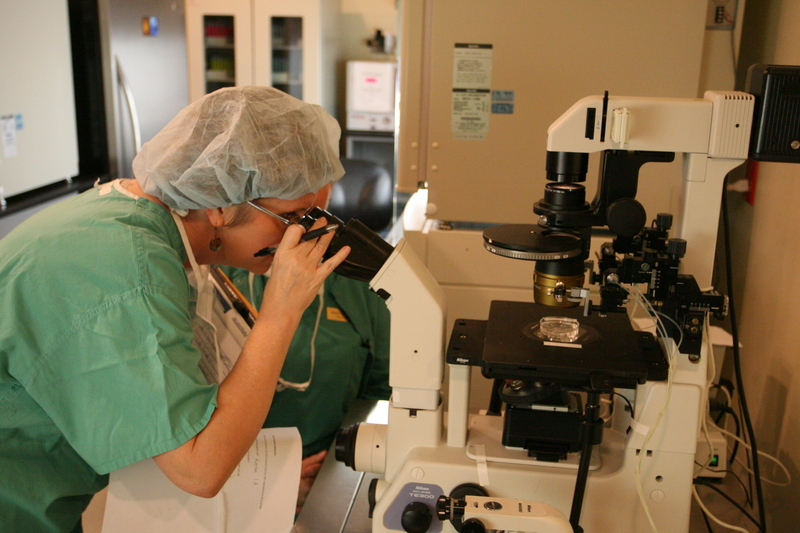 Kristin meets with patients who come to Austin IVF (in vitro fertilization) and works closely with the doctors who perform the physical procedures. 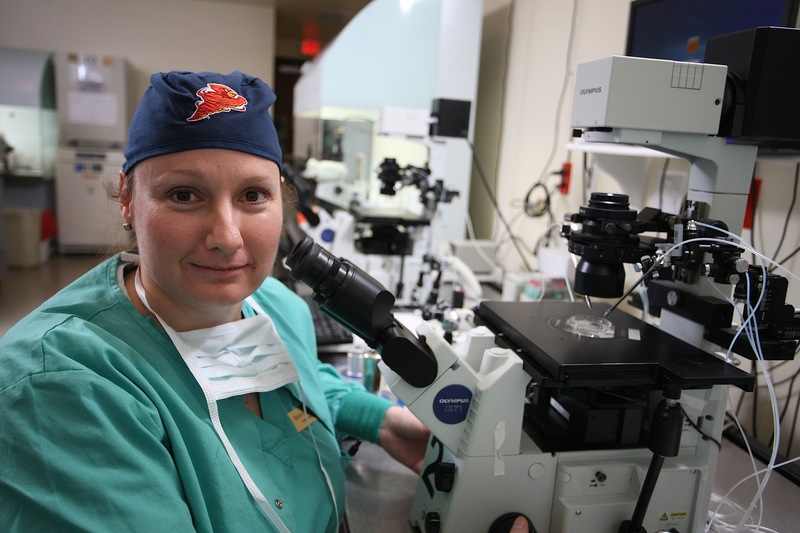 Once in the lab, Kristin and the other human embryologists inseminate the eggs, often by injecting sperm directly into the egg with the aid of a high-powered microscope. After 3-5 days the embryos are implanted. Kristin, a Keota, Iowa native, received her animal science degree in 1998 and went on to earn an MS in animal physiology with a specialization in reproductive physiology in 2001. She’s been working at Austin IVF less than a year, after working in similar clinics in Dallas for two years and in Wichita for seven years. “I think I have a really cool job,” Kristin said. Kristin gave photographer Jim Heemstra and me a behind-the scenes tour of the lab and surgical suite. IVF is a fascinating process and serious business, but Kristin and her colleagues seem to have a lot of fun working together. The day we were there, Kristin’s co-workers teased her about her allegiance to Iowa State. As we get into the new year, plans are underway for the next two VISIONS Across America trips. First up in February is Hawaii, where we’re meeting with three alumni on the island of Oahu. After that, we’ll be going to the southeast states of Georgia, Alabama, Mississippi, and South Carolina in March. We may try to include Tennessee in this trip, or we might wait to go there in May — that’s still sort of up in the air. If you live in any of these southeast states and haven’t sent us your story ideas yet — or if you know alumni who live there who would make great stories for our VISIONS Across America project — please send them to me by next week (cgieseke@iastate.edu) so we can start contacting alumni and firming up our travel plans. We also hope to have an alumni event in Atlanta on or around March 23 — stay tuned for details if you live in that area. And just so you’re aware, we’re always accepting story ideas for ANY state we haven’t yet covered. This is a two-year process, so we’re working through the country little bits at a time. So far it’s been a blast hearing from so many of you! But, more importantly, Linda Wagner feels great. And she’s on a crusade to help others feel great, too. Her nutrition consulting business is booming, with clients connecting with her from the greater Austin area and beyond – way beyond – from as far away as the Cayman Islands and Australia. Her blog has an average of 100,000 visitors each month, with viewers looking for advice on everything from weight loss to feeling more energetic to clearing up their skin. Linda was an all-conference athlete at Iowa State as a springboard diver in the early 2000s. A month after graduating with a degree in psychology, she moved to Austin to train at the University of Texas in hopes of making the U.S. National Team. She placed 6th at nationals in 2005, but it wasn’t enough to earn a spot on the team. And a persistent back injury led her to give up the sport. For the next four years, she worked and trained with a clinical nutritionist. Her life’s work now centers on “nutrition to invigorate mind, body, and spirit.” Linda’s one-woman business promotes the concepts of whole-food nutrition and long-term lifestyle changes. Linda says yo-yo dieting, calorie counting, and the “next new thing” have combined to make Americans less healthy. But she sees a trend starting to emerge. Linda credits Iowa State with preparing her for the challenges she’s faced as an entrepreneur. She handles every aspect of her business, from photography to social media to website design and working directly with clients. Austin offers more healthy choices than the average American city. Linda hikes, bikes, and walks the city’s trails with her dog. She shops at Whole Foods Market and at Austin’s many farmers’ markets. Jim and I ate breakfast with Linda at Bouldin Creek Café, a vegetarian restaurant and coffeehouse. Afterwards, she took us to Boggy Creek Farm, an organic farm in Austin known for its fresh, organic produce and eggs from happy chickens.